I’m going to be part of a Pride Day appearance at Jim Hanley’s Universe in New York city on Saturday, June 27! June 27 is Pride Day at Jim Hanley’s Universe! 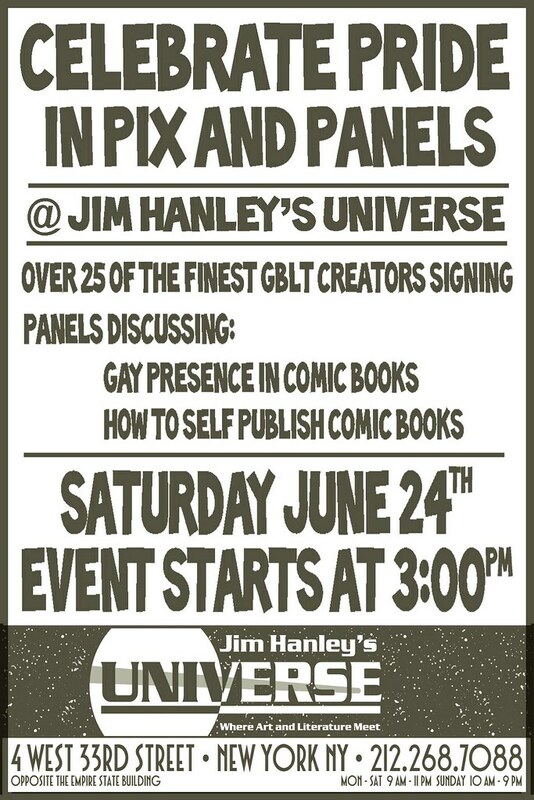 It’s the eve of the 40th anniversary of the Stonewall Rebellion, and on Saturday, June 27, Jim Hanley’s Universe will be having a jam-packed day of events in celebration of comics and LGBT Pride Day! The day’s festivities kick off at 3:00pm featuring creator signings with over 25 of the best LGBT creators in the world including Tony Arena, Amy Colburn, Foxy Andy, Erica Friedman, Rica Takashima, Abby Denson, Jennifer Camper, Steve MacIsaac, JD Glass, Allan Neuwirth, Ivan Velez, Jose Villarubia and many more! In addition, we will have a series of panels in our event space, the JHU Underground, including panels on Gay Presence in Comics and Self-Publishing! Events start at 3:00, I’ll be there until about 5:00 – 5:30. Jim Hanley’s Universe is at 4 West 33rd Street, New York, across from the Empire State Building.